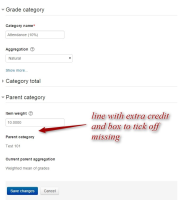 Enable Weighted mean of grades and Simple weighted mean of grades in the grade admin. Confirm that only the two EC grade items show the extra credit "+"
Confirm that the two EC grade items and the 3 aggregation categories all show the extra credit "+"
Enable Weighted mean of grades and Simple weighted mean of grades in the grade admin. Create a course Go into the Categories and items page in the gradebook Add a category called Natural with the aggregation method set to the same Add a grade item called "Reg", with all the default settings, except set it's category to Natural Add a grade item called "EC", with all the default settings, except set it's category to Natural Edit the grade item called "EC", setting 'Extra Credit' under parent category Add a category called Weighted mean of grades with the aggregation method set to the same Add a grade item called "Reg", with all the default settings, except set it's category to Weighted mean of grades Add a category called Simple weighted mean of grades with the aggregation method set to the same Add a grade item called "Reg", with all the default settings, except set it's category to Simple weighted mean of grades Add a grade item called "EC", with all the default settings, except set it's category to Simple weighted mean of grades Edit the grade item called "EC", setting 'Extra Credit' under parent category Confirm that only the two EC grade items show the extra credit "+" Go into each of the 3 aggregation categories and turn on extra credit under parent category Confirm that the two EC grade items and the 3 aggregation categories all show the extra credit "+" Change the course aggregation method to Weighted mean of grades Give each of the 3 aggregation categories a weight of 10 and save Confirm that only the two EC grade items show the extra credit "+"